This is a crash course on everything you need to know about callable bonds for the CFA Level 1 exam. As you know, bond prices have an inverse relationship with interest rates. This inverse relationship occurs because the present value of all the remaining payments decreases as the interest rate increases. Thus as a bond investor you face two main types of interest rate risk—price risk and reinvestment risk. Price risk, or interest rate risk, is the decrease (or increase) in bond prices caused by a rise (fall) in interest rates. It tell us how much the value of the portfolio fluctuates. The longer the duration of a bond the greater its price volatility. In other words a change in interest rates has a greater effect on the price of a longer duration bond than a shorter one. Reinvestment risk refers to the increase (decrease) in cash flow or investment income caused by a rise (fall) in interest rates. If interest rates go up, any new money you invest in a bond will have a higher coupon or cash payment. An investor in a callable bond faces both less potential price appreciation if interest rates decline and much more reinvestment risk. Always remember embedded options benefit the party that has the right to exercise them. Callable bonds give the issuer the right (but not the obligation) to buy the bond at a specified call price. The embedded call option is beneficial to an issuer as it allows them to take advantage of either a fall in market interest rates or an improvement in their creditworthiness. Because of the value of being long the call option an issuer that is selling a bond with an embedded call option will have to offer a higher coupon rate to entice investors to purchase it. Otherwise they'll just purchase the other company's option-free bond and not be exposed to so much reinvestment risk. Yield-to-worst: You can calculate price for a callable bond at every possible call date. The yield-to-worst is the lowest yielding / worst potential return result. This exact calculation is unlikely to be extensively tested on the CFA L1 exam. How does the presence of a call option change a bond's payouts? If r ↓, P ↑: The incentive for the issuer to call the bond at par increases. Therefore, the price of a callable bond will not rise as quickly as the price of a on-callable bond. Graphically, you can see that how much of an impact the call has on bond prices varies based on the relationship of interest rates relative to the coupon rates. The price of the callable bond will not increase as much as a non-callable bond. It suffers from what is known as price compression. 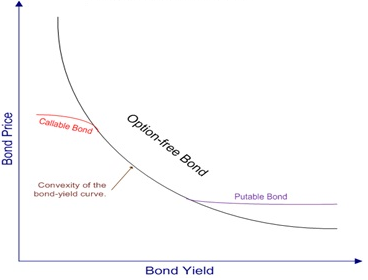 When yields are very low and the call is in the money, callable bonds will exhibit negative convexity. Negative convexity means that as market yields decrease, duration decreases as well. Key takeaway: Callable bonds will underperform when interest rates fall relative to the coupon rate, and will perform similar to an option-free bond in a period of rising interest rates. Visually, this means the shape of the yield curve will be concave (downward sloping) for the yields/price where the bond is in the money.